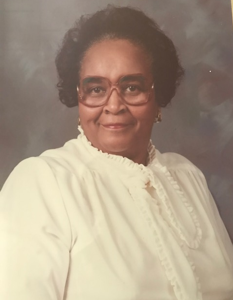 Mrs. Nannie P. Robertson of Green Level departed this life on Wednesday, April 10, 2019, 2:24 p.m. at Alamance Health Care. Born in Person County on June 17, 1929, she was the daughter of Clyde and Nannie Valines-Torain, both deceased. She was the wife of the late James L. Robertson. Mrs. Robertson was a member of Green Level Christian Church on Green Level Church Road. her youngest daughter. Mrs. Robertson is survived by six children; Ernestine Durbin (Dan) of Campobello, South Carolina, Mary Louise Huntley (Boris) of Charlotte, N.C., Delores Ann Shipmon of Alpharetta, Ga., Gwen Wilson of Dallas, TX., Gwendolyn Rivers of Green Level, N.C., Janie Pearl Robertson of Burlington, N.C., two sisters; Cora Hester, Evangeline Dixon, and one brother Roosevelt Torain, eight grandchildren, eleven great-grandchildren, three great-great grandchildren and a host of nieces, nephews, and other relatives and friends. Preceding her in death was a sister, Mary D. Bradsher, a brother, William Harvey Torain, and son-in-law Thomas Shipmon. Nannie was 89 years old.